Széchenyi Thermal Baths, Budapest, 2015, acrylic on canvas, 54 x 54 in. The Alps, Chamonix, France, 2015, acrylic on canvas, 32 x 32 in. Apt, Provence, France, 2015, acrylic on canvas, 32 x 32 in. Stow Lake, San Francisco, 2016, acrylic on canvas, 18 x 18"
Luberon, France, 2015, watercolor, 9 x 13 in. Festival Crowd, 2010, acrylic on canvas, 42 x 74 in. People in a Field, 2010, watercolor and acylic on paper, 30 x 41 in. 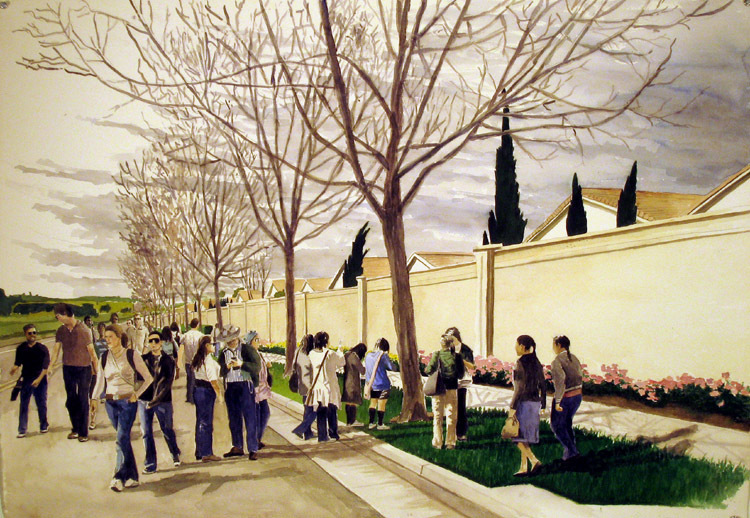 People in Suburban Street, 2010, watercolor and acrylic on paper, 30 x 41 in. Golden Gate Park Crowd, 2011, acrylic on canvas, 36 x 36 in.